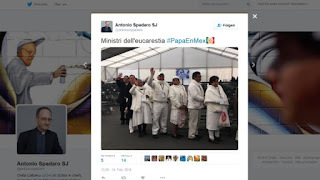 (Mexico City) Sources of information about the pastoral visit of Pope Francis to Mexico includes the Twitter account of the Jesuit priest, Antonio Spadaro. Spadaro is the editor of the Roman Jesuit journal La Civilta Cattolica . He is considered to be one of those closest personal friends to the Argentine Pope. On September 2013 he published the first media interview with Francis. The editor is very active on Twitter and sends short messages several times a day, including on the Pope's Mass in Ecatepec in Mexico City. So he also sent the above picture and wrote: "Ministri dell'Eucaristia" (Minister of the Eucharist). Such designation is explicitly rejected by the current provisions. "Ministers of the Eucharist" are priests only, as the instruction Redemptionis Sacramentum 2004 reaffirmed. Did Father Spadaro mistake the "minister of the Eucharist" with communion helpers? A lapse or Freudian slip? 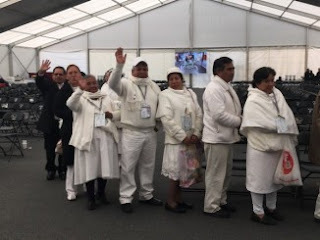 The picture shows namely without doubt extraordinary ministers of Holy Communion, which are briefly mentioned in the German extraordinary minister of holy communion. It is to lay people who may be appointed in urgent need case, what the Pope's Mass was the case yesterday in Ecatepec. Extraordinary ministers of holy communion: precedent for current interest? The introduction of the extraordinary minister of holy Eucharist is regarded as a precedent for a mechanism to establish changes in the Church. In 1964 the Berlin Ordinarienkonferenz, the forerunner of the later Berlin Bishops' Conference, which included the bishops of the Communist GDR, issued by Rome's permission to employ "suitable laymen" the diaspora areas for Communion at home worship. The measure was justified to serve the far-flung areas. In 1966 the exemption was extended. But then something amazing happened. Although the measure for a given area was granted on the basis of a specific "emergency", it was dealt with in 1967 by the Pope Paul VI. approved instruction Eucharisticum Mysterium in its extension to the entire world Church. The GDR with its diaspora situation was atypical of the Catholic world. Because of the communist dictatorship and the isolation by the Wall, the situation there was also withdrawn from the direct view of the world public. Nevertheless, it served as a trial run which was totallly justified with a total ecclesiastical decision. The situation is reminiscent of today's Amazon workshop and the attempt to receive permission there to allow married "viri probati" ordination because of the alleged lack of priests. According to the ideas of the promoters, the "Amazon model" could be just as quickly extended to the entire Catholic Church. An exceptional situation serves to introduce an exemption. It's a breach in the wall that will quickly lead to the complete dam break. As a result of the introduction of Communion, priests in some churches no longer distribute Communion to let the layman take precedence. More often, there is no clear need for an extraordinary minister of holy communion, yet they are used. Even when in papal liturgies it already comes to an undignified treatment of the body of Christ, as the World Youth Day 2013 in Rio de Janeiro or at the Pope's Mass in Manila in January, 2015. The Roman permission stressing the exceptional status: the layman is only an "extraordinary" minister of holy communion, to be used only "if necessary". [88.] The faithful should normally receive sacramental Communion of the Eucharist during Mass itself, at the moment laid down by the rite of celebration, that is to say, just after the Priest celebrant’s Communion. It is the Priest celebrant’s responsibility to minister Communion, perhaps assisted by other Priests or Deacons; and he should not resume the Mass until after the Communion of the faithful is concluded. Only when there is a necessity may extraordinary ministers assist the Priest celebrant in accordance with the norm of law. Well, Well! You could have fooled me! Here in our Australian Diocesan church there is a plethora of communion ministers that rush up to the Altar every Sunday - five or six of them - and distribute Holy Communion in both species. At the end they drain (by quaffing) the chalices of the Precious Blood on the way to the kitchen/washing up area and then wash them out. One Communion minister will take the ciborium back to the Tabernacle (which is, of course, outside the area of the church proper) and, often without any genuflection or even a bow, pop it back through the door and lock it up. people who distribute the Holy Communion. Just ordinary, everyday stuff - part of the Mass. Along with the clapping, thanking everyone for breathing, and meaningless and boring sermons about nothing Catholic but everything politically correct. Any comments, anyone? Stop attending and find a traditional Mass in Latin, the Catholic Mass and you can like I did dump all this protestant theology. Thank you Father - What is the number that "is so great?" Is It 600? 900? Attendance for you appears to be a regular occasion of scandal, if not sin. Stop attending and take care of your own soul. Once they violated & destroyed the centuries old holy week in the 1950's,everything was up for grabs.